Prepare for an exhilarating journey as you set off on the open highways of America for high-octane action as you showcase your thirst for speed and get pursued by the cops with their sirens ringing out loudly, and there are plenty of drive-thrus for you to stop by in order to fuel up again – with gas and burgers both on the menu! Boasting an impressive 96.96% return to player percentage, 5 Reel Drive is part of the Quickfire series (which has proved popular at UK online casinos that offer Microgaming slots) and is a 5-reeled slot machine containing 9 fixed paylines, which is a more common structure for online slots by Novomatic rather than Microgaming - but it does keep things very simple and straightforward. Saying that, there are some big negatives which could see you slip into reverse gear and make a rapid escape. To begin with you’ll have to endure the ghastly mechanical sounds we hear so often in online fruit machines with only the faint tooting noise of horns playing out whenever you land winning combinations and there is a minimum stake of 25p per payline which may be out of the bankroll management limits of many players – especially for how basic it is as it desperately lacks bonus features like instant wins, pick ‘em games or free spins features with only Wilds that substitute and Scatter pays of up to 50x your stake included. As you put your foot down and see how fast your car can go on the open highway you’ll be hoping to attract the attention of the police in order for an adrenaline pumping chase. The police cars are the Scatter symbols and whenever you spot three of them in your rear view mirror with the red and blue sirens flashing brightly, and extremely loudly, your pulse will be left racing as you attempt to speed away from them and enjoy instant Scatter pays, with the more that pursuit you meaning a greater thrill and rewards. Three police cars will see you win 5x your stake, four of them chasing you sees you claim 20x your stake, while five of them attempting to halt your thirst for speed will see you win 50x your stake. 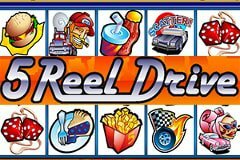 Aside from the police cars, there are eleven other symbols that feature on the reels of the 5 Reel Drive slot machine which consist of a mixture of highway and drive-thru diner symbols. The Wild symbol has been designed in the style of a road sign with a black arrow pointing forwards on a bright yellow background to ensure you can view it as you speed past, and while this can substitute for all symbols except for Scatters, it is a little disappointing that it does not offer any payouts itself. The most valuable symbol on the reels is a flaming wheel with a chequered flag with five of these on a single line resulting in a turbo win of 10,000 coins. The smoking hot wins continue with three fellow speed junkies who you will race down the open highway with as a cigar smoking trucker tries to slow you down, a goggle-wearing man drives a yellow Cadillac, and a female with bright red lipstick and sunglasses drives a pink Cadillac, with dice that hang from your mirror featuring too. Of course, all this tyre burning as you race on the roads can get very tiring and you’ll have to pop into one of the drive-thrus in order to refuel with some fast food before setting off at breakneck speeds once again. A big greasy cheeseburger is top of this menu plus you can also order French fries, sodas that are filled with sugar to give you a quick energy boost, with blueberry pie on the menu for dessert, and you can finish your feast with a cup of coffee and an iced doughnut. 5 Reel Drive is as basic as its structure and you may wish to put pedal to the metal and make your escape as this is a pretty dull slot lacking in bonus features, with the only excitement coming when you see police cars for Scatter pays. If you’re a fan of fast food you should check out the American Diner slot machine from Novomatic while the Easy Slider slot machine from NextGen Gaming could see you jump on a motorbike for an adrenaline pumping journey instead.